Many people are interested in the Mysteries and contributions of Ancient Egyptians. The pyramids are a beautiful mystery that the world marvels at. The longevity and sheer size of them alone are enough to spark all types of theories as to how the Egyptians managed to pull off such a feat. They did so without any of our modern conveniences or machinery. They are still standing today. If you or your family is interested in Egyptian culture, then this project would be perfect. Here is an easy way you can build a pyramid model from scratch. Plan the design for your pyramid. Research the matter by looking online. Find pictures and make a sketch from your observations. The Egyptians actually made the pyramids out of stone. You should also build your pyramids with blocks that are similar in look and texture to make a realistic representation. Decide the best materials you will need to make your pyramid model. Make note that although wood and Styrofoam are great materials to use, they are not at all easy to work with. A substance like clay or Plaster of Paris far easier to build this project with. You will need an adhesive if you decide to use Plaster of Paris, stone or wood. Begin with the base of your pyramid and move upwards. If you are using Plaster of Paris, form them using an ice cube tray. You will need to put a coating of petroleum jelly inside the ice cube trays to make sure the Plaster of Paris does not stick and is easy to remove after you form your blocks. Assemble your pyramid. Sand the edges smooth when they are dry. Use a sharp knife to size the edge of the pyramid if you used clay or Styrofoam. You can use a piece of sand paper for the Plaster of Paris of wood instead. Use a level to ensure it is both balanced and flat. Decorate and paint the pyramid whatever color you like. If you are aiming for a more realistic look then you can use sandy colors or different shades of brown. 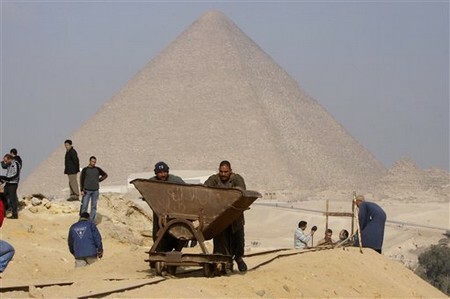 The pyramids were made from sand and had a natural color. Seal your new pyramid model with a goodweather proof sealant. If you protect the pyramid model by painting it with, the sealant will prevent the paint from chipping and prevent some normal wear and tear from happening. Enjoy your new pyramid model.